Check out this HOT deal on this Kidzlane Durable Walkie Talkies, Easy To Use and Kids Friendly, 2 Mile Range, 3 Channel Priced at only $17.99 was $39.99. Ships Free with Amazon Prime! MAX RANGE +3 CHANNELS: Get the most fun out of our walkie talkie set of 2! With a 2 mile range, our set is bound to be an instant favorite on your kids adventures around the neighborhood! Also features 3 separate channel operation for those super-secret fun conversations! EASY TO USE: With a simple push to talk operation, is guaranteed to get your kid hooked and playing with immediately! Immediate fun, right out of the box! 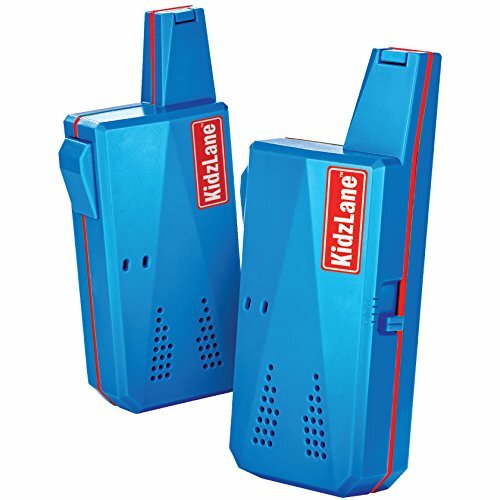 NON-STOP FUN: Kidzlane Walkie Talkies will get through the longest games indoors and outdoors, They will last an astounding 9 hours on standby and 3.5 hours of continuous use. PLAYFUL DESIGN: Our Walkie Talkies feature a playful and unique design that any kid will love! Furthermore, it sports LED Indicators and has a clip on belt holder for easy carrying around! 100% MONEY BACK GUARANTEE – We want you to be completely satisfied! If you have any problems with our Walkie Talkies whatsoever, just let us know and we will make it right.